I commit to eating healthy this year and ENJOYING it! How about you? I learned something recently. Trying to make myself work at things when I’m off the clock doesn’t motivate me nearly as well as intending to enjoy doing the exact same thing. That means I look forward to it instead of thinking of my New Year’s Resolution as just one more thing I HAVE to do in an already busy and not fun-filled enough life! But make it fun? Call it snacking? No problem! 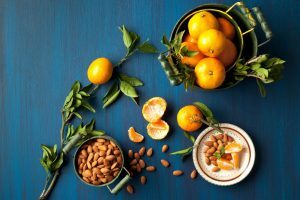 Substitute a handful of almonds a day for something you eat that might not be as healthy and you’ll have an excellent start at creating a heart-healthy diet–and it might help with controlling diabetes and losing weight! But there’s that word “substitute.” That means you’re giving something up! UNLESS you’re adding something in that’s fun and delicious. Snacking with Maisie Jane’s to the rescue! 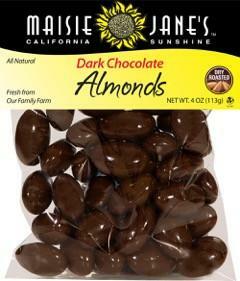 One of my favorite decadent-feeling snacks is a small handful of Dark Chocolate Almonds. The trick is to look forward to it and SAVOR them! Don’t just pop 3-4 in your mouth and reach for more. Take 5 or 6 and really enjoy each one. A stress reduction teacher taught me this in a class I attended years ago. He had everyone in the class eat ONE delicious treat and really pay attention to the delightful experience of eating it. Notice the look of it, take a bite and really savor the taste and feel of it in your mouth, chew slowly while continuing to notice how good it tastes, and then swallow. It was a meditation on deliciousness and enjoyment of life—something so many of us rarely take the time to do. And guess what? Everyone in the class said they not only enjoyed slowing down and being in the present moment this way, they found themselves satisfied while eating less! And if your treat is Dark Chocolate Almonds, you’re getting useful almond nutrition wrapped in something that adds more health benefits. Antioxidants, lowered bad cholesterol, lower blood pressure, lower carb, all the benefits you’d want in a healthy snack . . . but it tastes like chocolate! 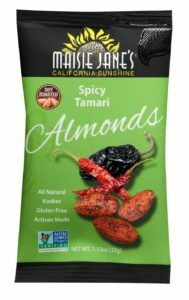 I also love our Spicy Tamari Almonds snack pack. Well, ALL the snack packs, really. But I especially like this one because it has just the right combination of cayenne, chili pepper, and tamari to heat up my metabolism without being so hot as to be overpowering. And the amount of almonds in each snack pack (1.13 oz) is just about the perfect amount for a nutrition-rich snack that’s far more interesting and healthy than a handful of greasy, high-carb potato chips or some other typical snack-time choice. It’s actually a TREAT! And finally, may I recommend my favorite treat: Maisie Jane’s Organic Smooth or Crunchy Almond Butter paired with sliced apples, pears or some other dippable fruit? How can something SO delicious be so good for you? I don’t know but it’s actually really good.